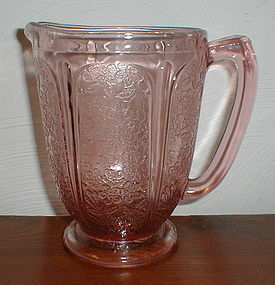 Pink, Cherry Blossom, Round Foot, AOP Pitcher in excellent condition. No damage or use marks. A couple of the usual mold marks. 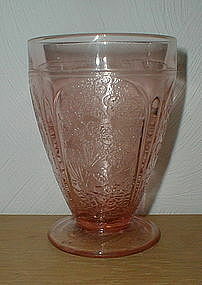 Pink, Jeannette Glass, Cherry Blossom, Child's Mugs, both in excellent condition with no damage or use marks. Delphite Cherry Blossom 3 3/4" 4 oz. Ftd. 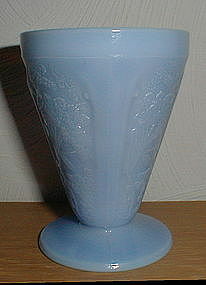 AOP Tumbler in excellent condition with no damage. Pink Cherry Blossom 4 1/2" 9 oz. 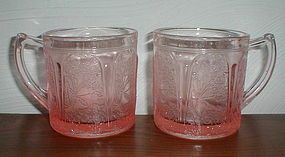 round footed AOP Tumblers in excellent/mint condition with no damage. 2 are available. Actual measurement is closer to 4 1/4". $30 for one or $50 for both. 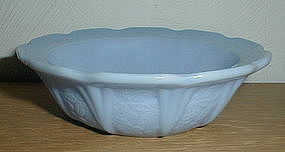 Delphite Cherry Blossom 4 3/4" Berry Bowls in very good condition. A very little bit of inner rim roughness from stacking (previous owner - not me), but no other damage or defects. Really nice bowls. $16.00 for one or $25 for two. 6 bowls are available. 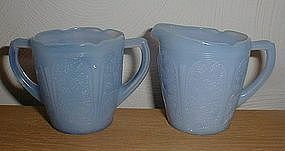 Delphite Cherry Blossom Creamer & Sugar, both pieces in excellent condition with no damage. 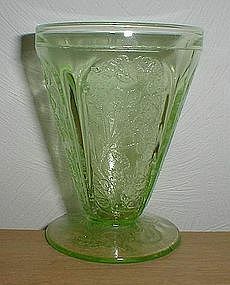 Green Cherry Blossom 3 3/4" round Footed AOP Tumbler in excellent condition with no damage or use marks. 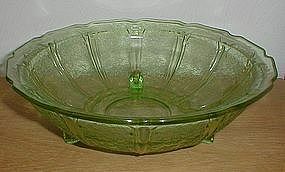 Green Cherry Blossom 10 1/2" 3 footed Fruit Bowl in excellent condition. No damage or use marks. One straw mark in the bottom inside that is a manufacturing item. Delphite Cherry Blossom 14 piece childrens set, all pieces in excellent/mint condition with no damage or use marks. 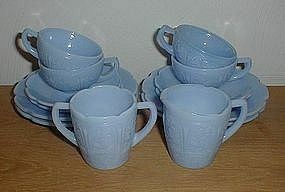 4 cups & saucers; 4 plates and sugar and creamer set. 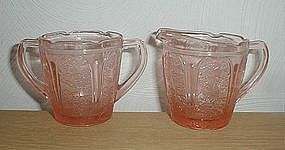 Pink Cherry Blossom children's Creamer and Sugar set, both pieces in excellent condition with no damage. Delphite Cherry Blossom children's creamer and sugar set, both pieces in excellent condition with no damage.